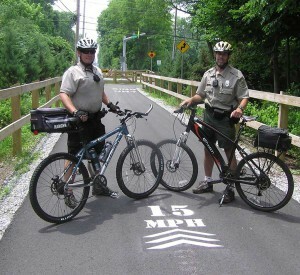 Regional Rangers Mike Trzaska (left) and Jay Erb (right) are two of eleven rangers that regualarly patrol the length of the Chester Valley Trail. They cooperate with local police to keep the trail safe and to educate trail users on sharing space on the trail. WEST CHESTER — Chester County is placing 15 mph speed limit markers on Chester Valley and Struble trails to improve safety for the tens of thousands of users of the trails. The Chester County Facilities and Parks department will place speed limit markers on the Chester Valley Trail by next week and then the Struble Trail. The speed limit also applies to the Schuylkill River Trail. The county has received complaints of cyclists exceeding the speed limit and three cycling-related accidents have been reported on the Chester Valley Trail this year. North Regional Park Superintendent Owen Prusack believes a lack of knowledge about trail safety is the issue. He said, “The speed limit is posted on the somewhat unobtrusive Trail Rules and Trail Etiquette signs, but it has become clear more obvious postings are needed. The county hopes to slow down cyclists, prevent accidents and cut down on complaints from other trail users and motorists traveling on intersecting roads. The speed markers will be placed each mile and include arrow signs signaling what direction users should be traveling. “The major rules of the trail are keep right, provide audible warning when passing, travel under 15 mph, and be courteous to other users,” said Prusack. The Chester Valley Trail has 30,000 users per month from April through October. The 14-mile trail extends from Commerce Drive in West Whiteland to County Line Road in Tredyffrin. The Struble Trail averages 11,000 users per month in the same time period and extends 2.5 miles from Norwood Road to Dorlan Mill Road.